This is a weekly feature in which I (and maybe you, too, readers) detail the various reasons for hating your ballpark. This week: The St. Louis Cardinals' Busch Stadium. Meat-beating in St. Louis: This is less about the stadium itself than about the fans who fill the stadium day after day, the best fans in baseball, who are so self-evidently the best fans in baseball that in the old Busch Stadium one could find a billboard in center proclaiming the fans to be the best fans in baseball. Why are Cardinals fans the best fans in baseball, you ask? I don't know, exactly, but one possibility is that the best fans in baseball clap loudly for sacrifice bunts and players named Skip. That's what baseball fans do, when they're the best fans in baseball. And you can tell it's true because people keep repeating that Cardinals fans are the best fans in baseball. "The best fans," Andy Van Slyke said in 1987, en route to Pittsburgh. "Best fans in baseball," Gerald Perry said back in 1990, as a new Cardinal (and it would be ungenerous to point out that, as a .250 hitter with no pop, he had good reason to butter up said best fans in baseball). "Best fans in baseball," Albert Pujols said the other day. "Best baseball fans in America," said Mark McGwire. "Best baseball fans in the world," said Rex Hudler (and it would be ungenerous to point out that Rex Hudler is an idiot). As a 36-year-old male, born, raised and still living in St. Louis, a devout Cardinals baseball fan, I have a few comments concerning Jon Saraceno's column ("Real sports fans don't celebrate wins with drunken hooliganism," Oct. 25). We here in St. Louis have grown accustomed to the "nicest fans" and "best baseball fans" slogans and tags over the years. We also have the largest brewery in the world in our backyard, Anheuser-Busch, and we have yet to riot, loot or have anyone killed because of a win or loss of a Cardinals baseball game. St. Louis and Cardinals fans are class acts. You "assume" that these "fanatics" who celebrate a win/or loss of the big game are drunk. Maybe they were on drugs, maybe they were just stupid teenagers in a mass of people wanting attention. Or maybe, just maybe, they were like the hundreds of people who rioted, looted and a few even beaten to death after the O.J. Simpson verdict was read. My point is, don't assume that "drunken hooliganism" is associated with celebrating a victory/loss. Maybe it's just some people's outright stupidity and their blatant disregard for the consequences that their idiotic actions cause. Understand? The best fans in baseball do not kill people. 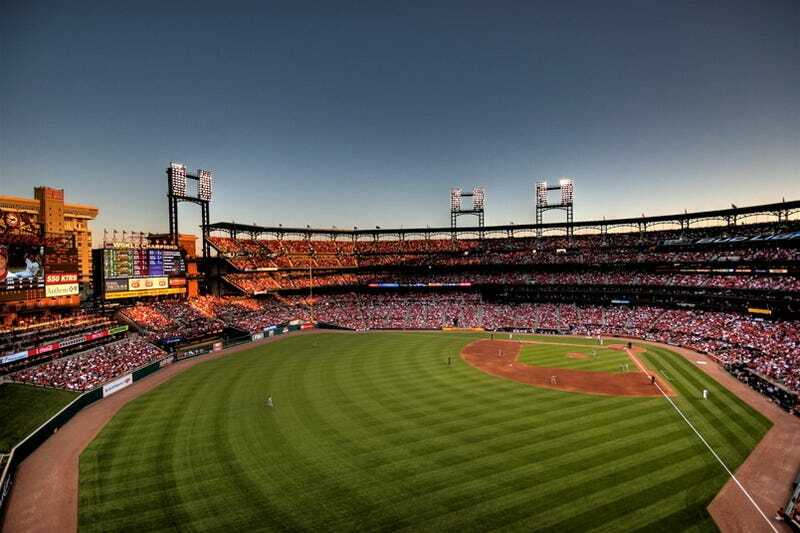 St. Louis is baseball's Shangri-La. I know this because Joe Buck says so, and he is my baseball sherpa. And because St. Louis is baseball's earthly paradise and therefore populated only by the pure of heart, the thought has never occurred to me that maybe there is a hint of rebuke in the phrase "best fans in baseball," that maybe the best fans in baseball think the rest of us are poor paste-eating slobs who don't appreciate baseball the way they do because we don't have full-body orgasms whenever a guy named Skip moves the runners over, that maybe the best fans in baseball have fetishized the idea of playing the game "the right way" as a way of clinging desperately to some lost and imaginary ideal of the past, that maybe the phrase is actually a sign of an ugly regional chauvinism, not to mention a deep-seated insecurity, and that maybe there is a serious pathology at work here, a sort of civic narcissistic personality disorder. No, sir, that thought has never occurred to me. St. Louis. Best fans in baseball. The view from the stands (everything sic'd): Note: A couple responses concerned the old Busch Stadium, but I've included them anyway. Photo via Jeremy Plemon's Flickr account. Next up: Miller Park. Got any horrible experiences to share? Send them to craggs@deadspin.com.